The Dow Jones Industrial Average closed slightly lower on Friday as Wall Street concluded a roller-coaster week. The 30-stock index ended the day down 76.42 points at 23,062.40. At its high of the day, it rose as much as 243.06 points; it fell as much as 155.26 points. The S&P 500 closed 0.1 percent lower at 2,485.74, led by losses in the energy sector, after rising as much as 1.26 percent. The Nasdaq Composite eked out a gain of 0.1 percent to end at 6,584.52, but closed well off its session high. Gains in Apple, Amazon and Netflix lifted the tech-heavy Nasdaq. For the week, the major averages all rose at least 2.75 percent, notching their first weekly gain in four. Stocks are still, however, on track for their worst December performance since 1931. The S&P 500 was down 9.9 percent for the month while the Dow has lost 9.7 percent. Friday's moves took place after the Dow closed 260 points higher on Thursday, erasing a 611-point loss. That reversal marked the 30-stock index's biggest intraday turnaround in eight years. The S&P 500 also posted solid gains after declining more than 2 percent while the Nasdaq erased a 3 percent loss. "We're in the year-end period where there are a lot of folks that have stepped away from the market and therefore some significant changes in buy or sells have a more profound impact on the market," said Gibson Smith, founder of Smith Capital Investors. "There's another big component: A lot of focus-driven issues are being driven to a head. Some of it is on trade, some of it on the government shutdown, the Federal Reserve versus Donald Trump, they are all coming to a head at a time when there is a lot of illiquidity in the market." "I think the market is growing tired of some of the uncertainty and some of the erratic nature of communication that has come out. That's causing some of the volatility," Smith added. "The volatility is going to continue and it's going to continue into the New Year. There are still a lot of unresolved issues that sit on the horizon." Thursday's gains added to Wednesday's historic rally in which the major indexes had their best day in nearly 10 years. "We all know that 2017 was an outlier - historically calm by multiple measurements. Volatility - on the other hand - is 'normal.' While very true, that tune can't be used to describe what's happened this week," Frank Cappelleri, executive director at Instinet, wrote in a note to clients. "In just two and a half days, the S&P 500 has witnessed its worst Christmas Eve showing ever, its biggest gain since 2009 and now the largest intra-day positive reversal since 2010." Investors have fretted over fears of a monetary policy mistake by the Federal Reserve, an ongoing government shutdown in Washington and potential signals the global economy may be slowing down. Wall Street is also watching developments on the trade front as China and the U.S. try to strike a deal on trade — and the clock ticks down on the two nations' tariff ceasefire. 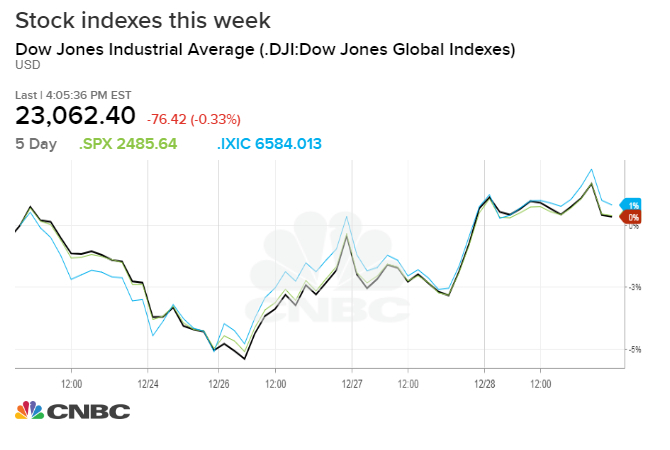 "When you look at more economically sensitive stocks in the United States today, they're priced as if a recession is a forgone conclusion," Sean Stannard-Stockton, president and chief investment officer at Ensemble Capital Management, told CNBC's "Squawk Box." That, he said, "might happen, but it also might not." "We definitely think that investors in kind of more economically sensitive, high-quality businesses are going to be well rewarded for buying stocks at these prices," Stannard-Stockton said. The recent moves in stocks also put the Dow and S&P 500 on track for their first yearly loss since 2015. The Nasdaq, meanwhile, was on pace to log its first yearly decline since 2011. Correction: This story has been updated to show that the reversal in the Dow is the biggest in eight years, not 10 years.